An enchanting reminder of a timeless tradition, these earrings will take your looks to great heights of elegance. They have a modern and olden blend with a brilliant finish. They are easy to wear and are a must-have for every jewellery collection. 14K solid yellow gold is used in these beautiful earrings. The overall beauty of these earrings is enhanced by a diamond cut feature of the surface. A beautiful texture is formed to increase the brightness. The diameter is no less than 30mm. 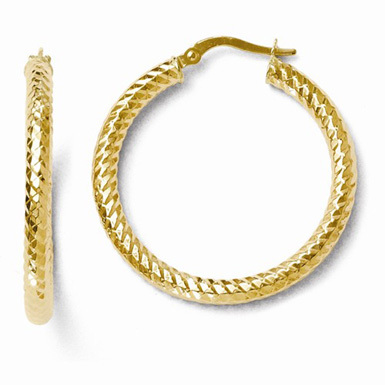 We guarantee our Diamond Cut Textured Hoop Earrings in 14k Yellow Gold to be high quality, authentic jewelry, as described above.